The NormaTec PULSE Recovery Systems are dynamic compression devices designed for recovery and rehab, using an air pressure massage indicated to temporarily relieve minor muscle aches and/or pains and to temporarily increase circulation to the treated areas. NormaTec’s patented PULSE technology to help athletes and patients to recover faster between trainings, treatments and after performance. NormaTec uses compressed air to massage your limbs, mobilize fluid, and speed recovery with our patented NormaTec Pulse Massage Pattern. When you use NormaTec systems, you will first experience a pre-inflate cycle, during which the connected attachments are molded to your exact body shape. The session will then begin by compressing your feet, hands, or upper quad (depending on which attachment you are using). Similar to the kneading and stroking done during a massage, each segment of the attachment will first compress in a pulsing manner and then release. This will repeat for each segment of the attachment as the compression pattern works its way up your limb. Gradients: Veins and lymphatic vessels have one-way valves that prevent fluid backflow. 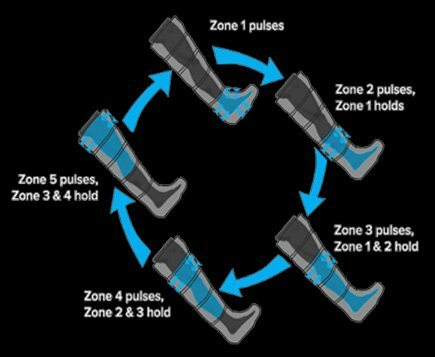 Similarly, NormaTec Pulse Technology uses hold pressures to keep fluids from being forced in the wrong direction. Because of this enhancement, instead of tapering pressure off, the PULSE PRO can deliver maximum pressure in every zone. Peristaltic Pulse Compression Upregulates PCG-1A and Enos in Human Muscle Tissue.